The saying used to go: You’ve got two chances — Buckley’s and None. I was always told it was based on the homophone department store Buckley and Nunn, combined with the older expression Buckley’s chance, which was probably from William Buckley, convict who escaped into the bush and was said to have had little chance of survival. Where was Buckley and Nunn? In Bourke Street, where David Jones is now. You can still see the name up high on the building. Nearby, the Target Centre used to be a Coles (with a cafeteria on the first floor where we sometimes went to have a meal), I think the David Jones store on the south side of Bourke Street (with menswear in it) used to be another Coles (both of them being “variety stores” of course, not supermarkets), and the Telstra T-Life shop used to be a Billy Guyatts (where my sister once met two members of Metallica in the basement records section, roughly where Readers Feast is now). Next → Next post: Back to the future? Coles cafeteria coined a phrase often heard at dinner tables around Melbourne ( and is still chanted in our house) when someone said they preferred something other than what was being cooked for tea it would get “This isn’t Coles cafeteria, you’ll get what you’re given”. Yes, I too had a teacher in grade 5 and 6 who was of that age where she would say ‘This isn’t Coles Cafeteria you know’ referring to noisy kids eating their lunch in the classroom before going outside. Funnily enough, I was reminiscing a week or so ago with someone and mentioned that we thought it was such a big treat to be taken to Coles Cafeteria for a meal when I and my siblings were young. I remember those other stores mentioned too. The highlight of school holidays with nana back in Shepp was being taken to Coles Cafeteria for lunch. I can still picture it as clear as day in my mind. 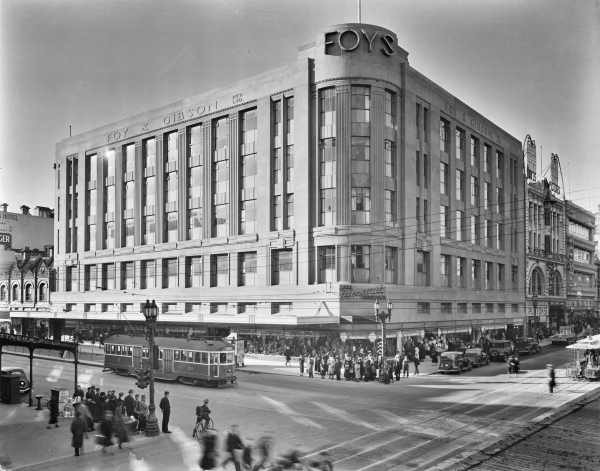 The Coles on the southern side of Bourke Street had dumb waiters, fascinating for kids. No not speechless waiters. Thanks Andrew S especially; I was going from my childhood memories, but some fascinating stuff in those links. Yes, I particularly remember a family meal at the Coles Cafeteria when there was some special promotion whereby you got to keep the Coke glass you’d used. We had never encountered such a wondrous concept before. I have memories of the restaurant at the Co-Op Department store in Birmingham (long gone, both restaurant and store). We always had lunch there whenever we went into the City (“into town” we called it though) in the holidays. It had waitresses (something I never encountered anywhere else we ever worked). The ywere all older ladies who worked like Torjans and were all brilliant at tehir jobs. Once when we went there they were giving diners free champagne to celebrate an anniversary of the restaurant and I remember “our” waitress let me have a little in a glass (I was very young at the time!). Funny the things you recollect. 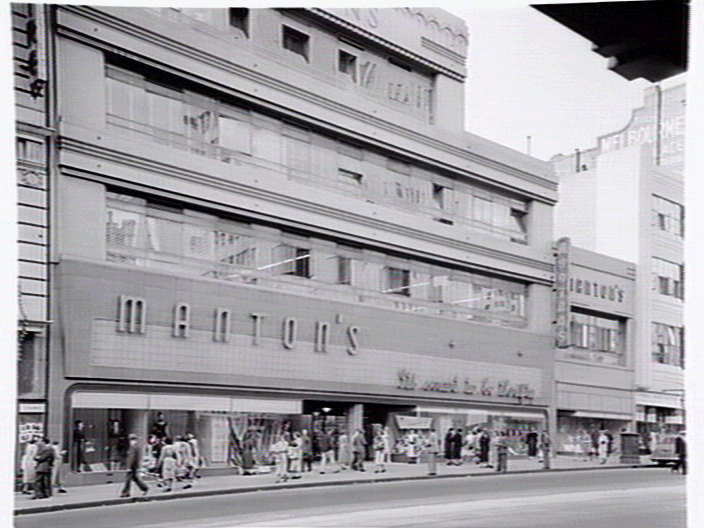 What was the suburban Melbourne department store with the distinctive clock tower, somehwere down towards Richamnd (?). 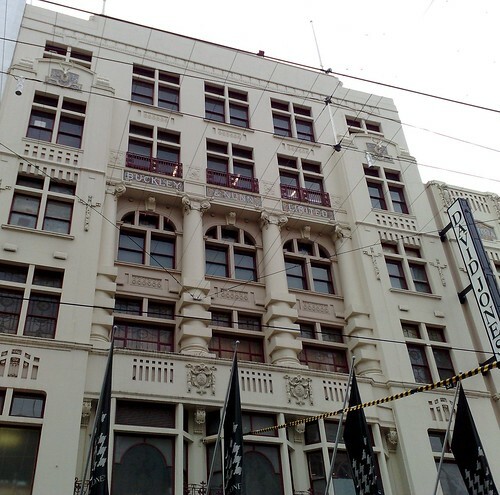 Real landmark building, on tram route 70 I think? Ian, you’re thinking of Dimmeys in Richmond (Pic). The company itself is scaling back operations — some of its Footscray Forges store is being sold off; I don’t recall what’s happening with the Richmond site. Hot fresh donuts from Coles in Burke street around morning tea. mmmm someone from the office would pop over and get a couple of dozen..
Also Many moons ago a worked at Buckley and Nunn when they were still called that name. It was an interesting place to work, some old some new. Dimmey’s. Yes, that was it. Another who enjoyed Coles cafetaria as a child with my mum and nan! Definitely a treat!